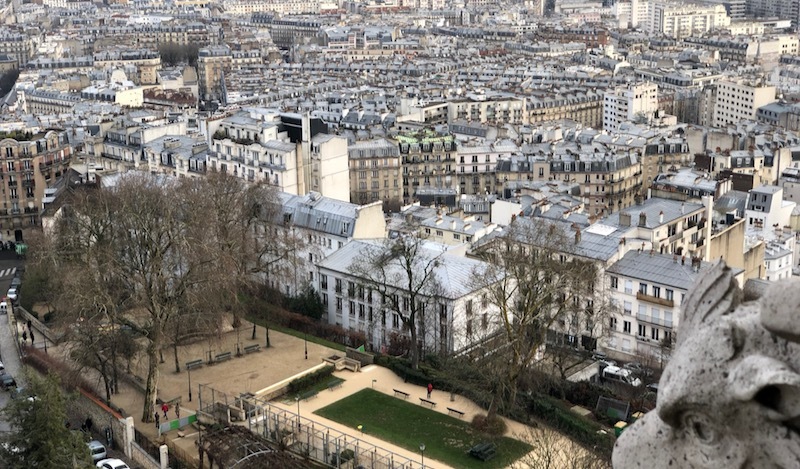 I just returned from a trip to Paris for the dotSwift conference. 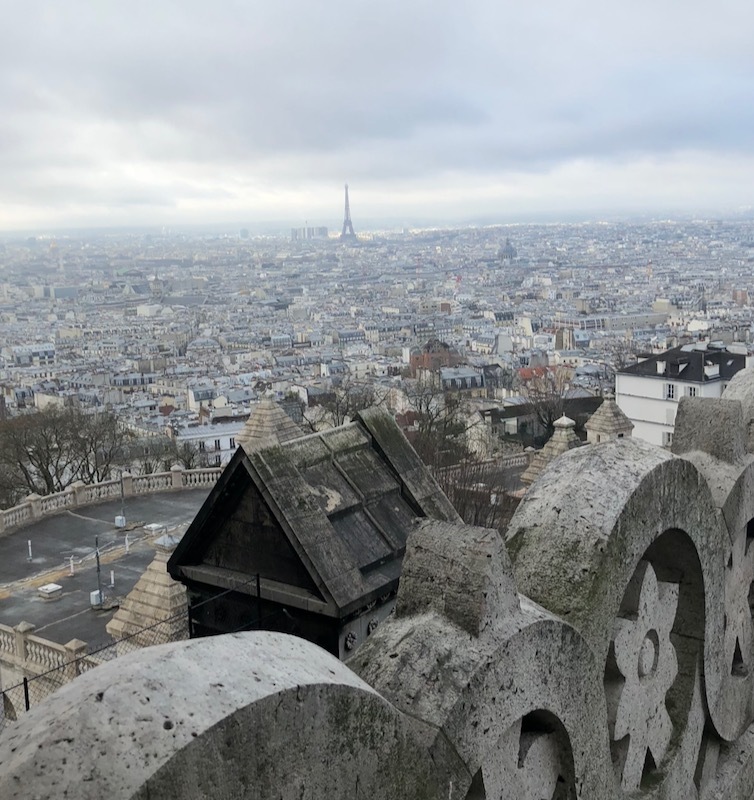 Since this is my third trip to Paris, I wanted to see a few things that I had missed in my previous trips. 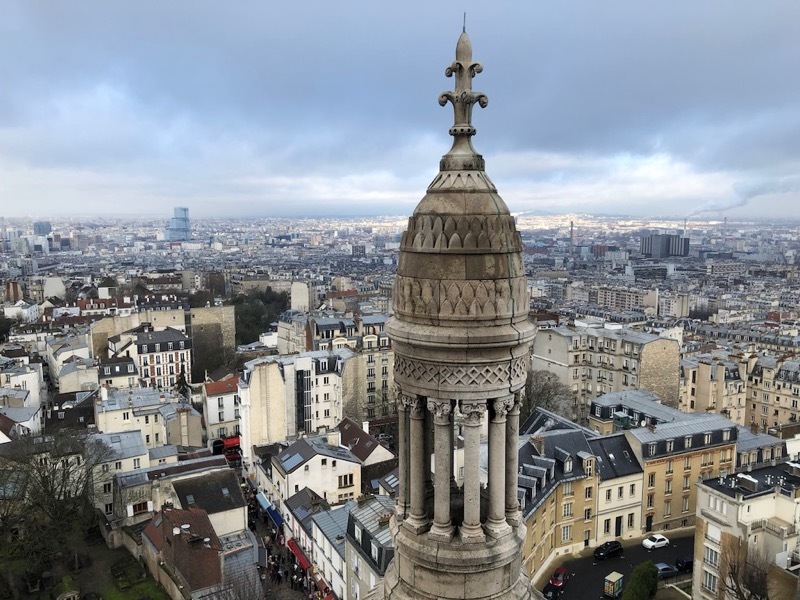 I arrived to Paris in the evening on Friday. My philosophy on traveling to minimize jet lag is to never take a nap. When I arrived I was very tired, but decided to force myself to walk around the neighborhood and look for a place to eat dinner. I found a great place called Flamboire nearby the hotel. It turned out to be an amazing find, and I had an epic day 1 meal. 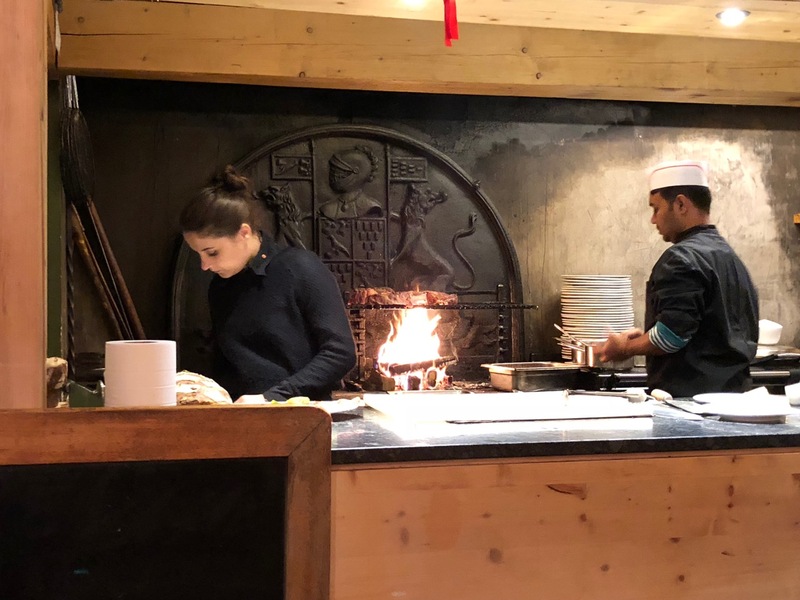 Flamboire has a small wood fire grill right by the dining room area so you can see your steaks cooking. After this meal and a little wine, I was sufficiently tired for a full night's sleep. 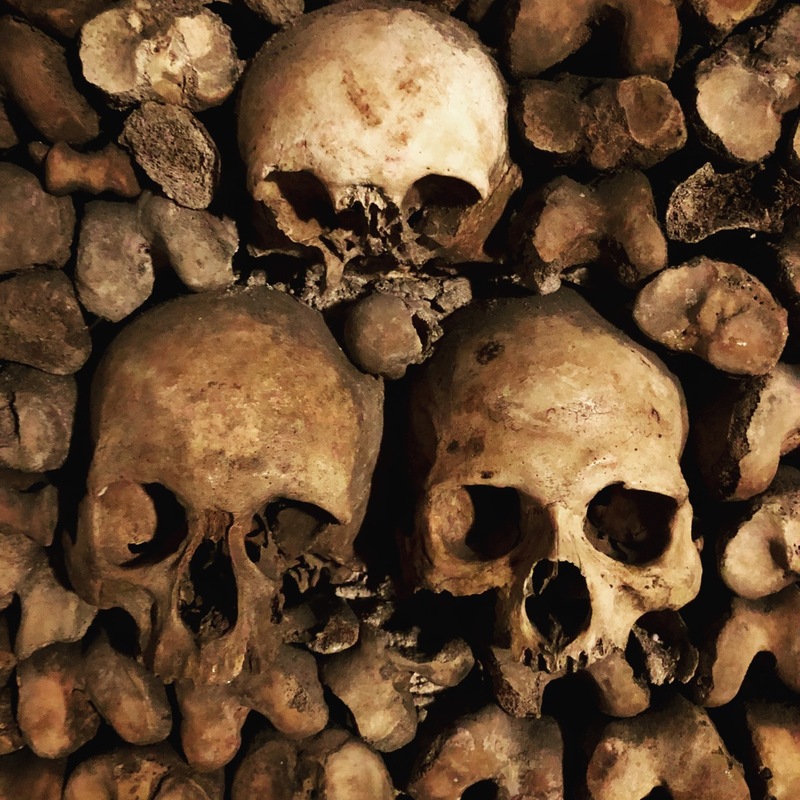 On Saturday I ventured over to the catacombs for a guided tour. 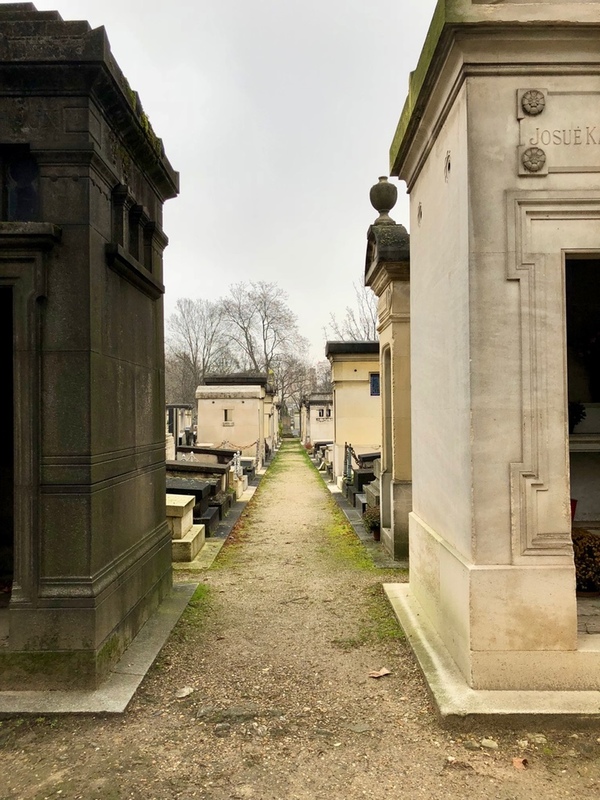 I was a bit early, so I walked nearby to the Cimetière du Montparnasse for a reverent, peaceful walk. 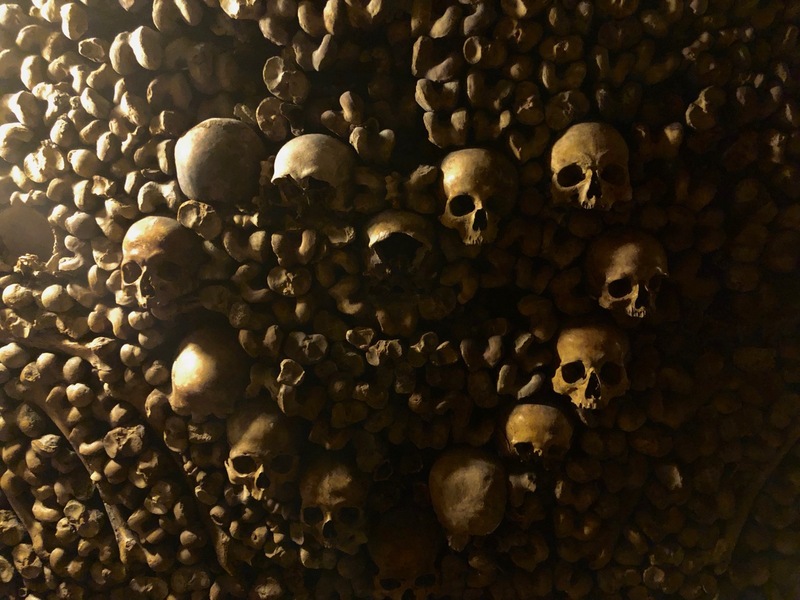 The Catacombs of Paris are an incredible sight, and it was interesting to experience a part of the history of Paris dating all the way back to Roman times. 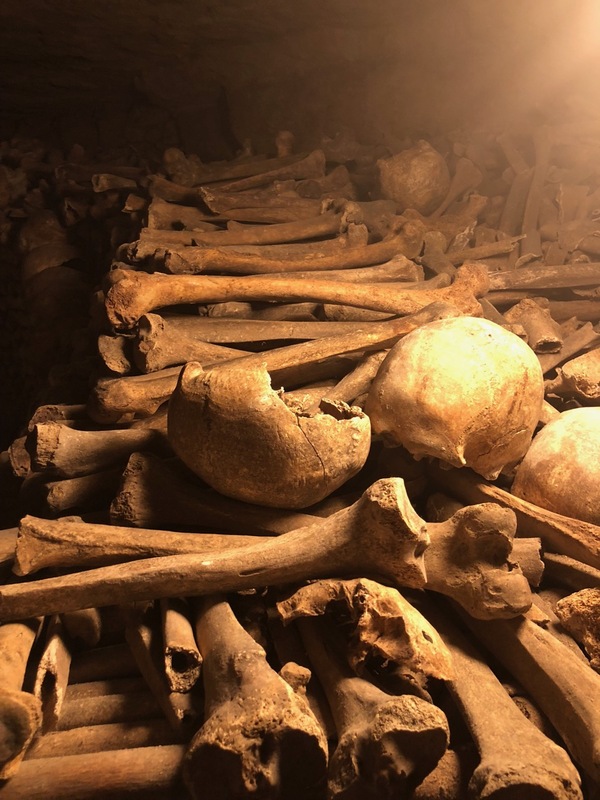 There are over 6 million bodies worth of bones arranged in the catacombs (our tour guide said it was probably closer to 8 million). 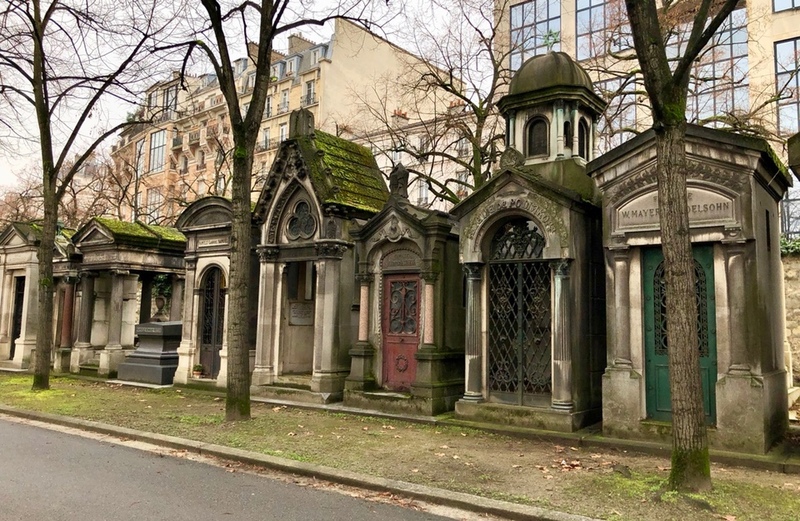 They were brought here due to severe overcrowding of Paris's cemeteries over their long history. 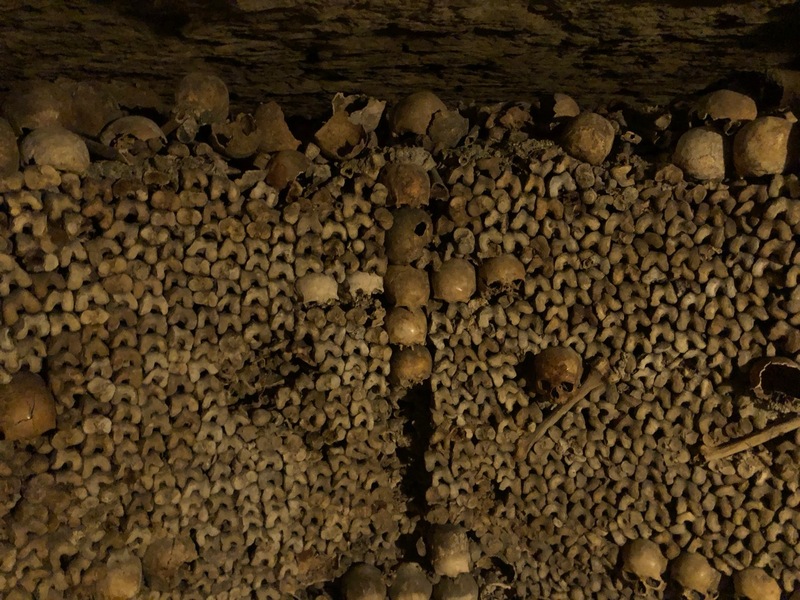 The smaller bones are essentially just piled up and pushed toward the sides of the tunnel. Then the larger bones (femur, skull, etc) were used with cement to create a barrier to hold everything in. 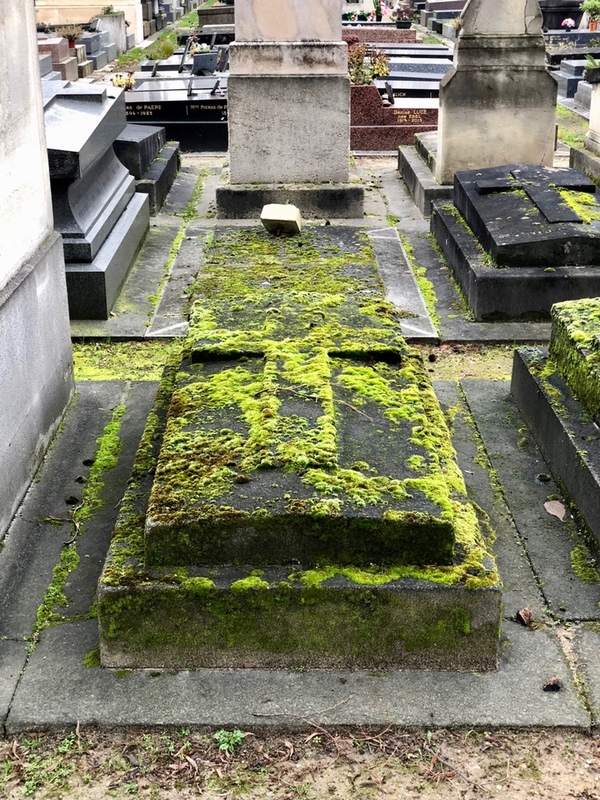 It was a rushed project to move all of these unmarked graves and took about 80 years. But even still, the workers added little touches to make the display a little more human (at the time, nobody thought it would be a tourist attraction). 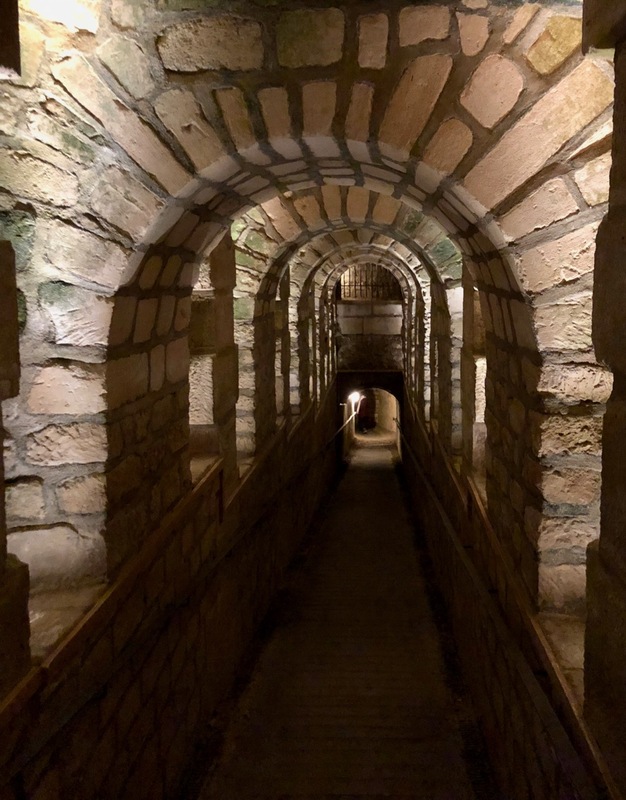 In addition to the random designs made into the bone walls, there was one incredible piece of art carved out of the limestone tunnel. The story behind it is fascinating. The short story is that this worker was a vetern who was captured on the island of Menorca in Spain in the late 18th century. 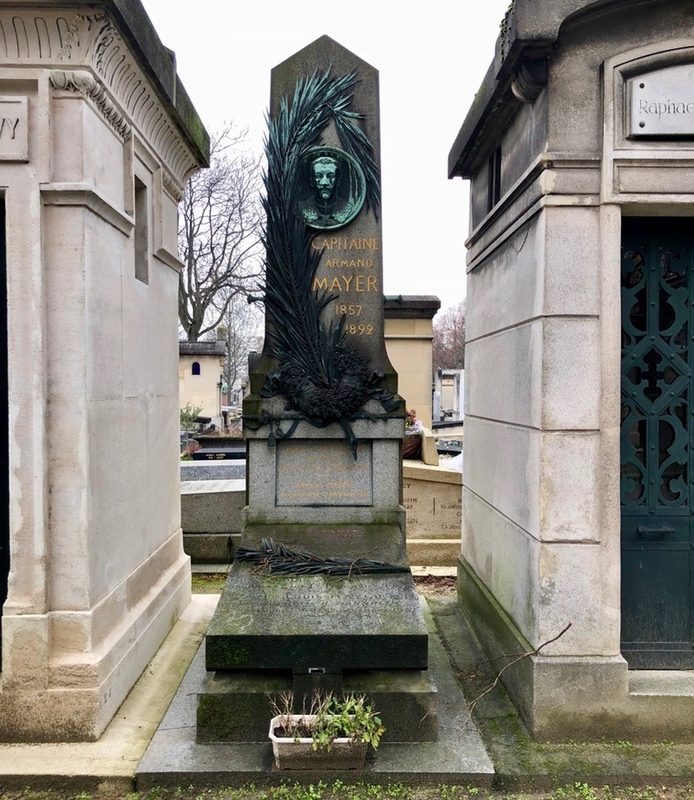 He eventually returned to France and moved to Paris to work on the catacombs (they often hired veterans to do this labor). He ended up spending 5 years carving out an incredible scene that was his view while imprisoned on the island. This scene is Port Mahon in Menorca Spain, and was the daily view of this captured soldier. 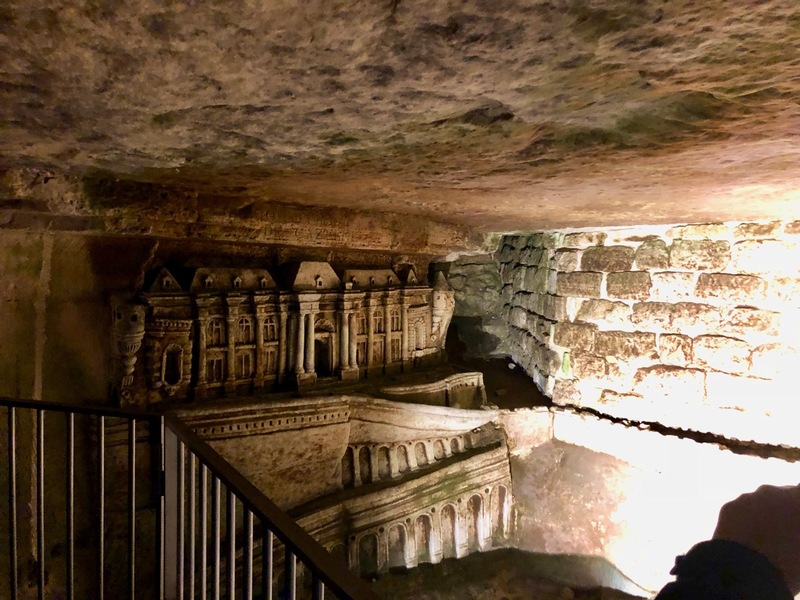 He carved this scene out in the tunnels - which was a place nobody would have ever known would be an attraction. Unfortunately, this man died when the cave collapsed above him. He was trying to carve stairs to the surface so he could invite people to see his work. 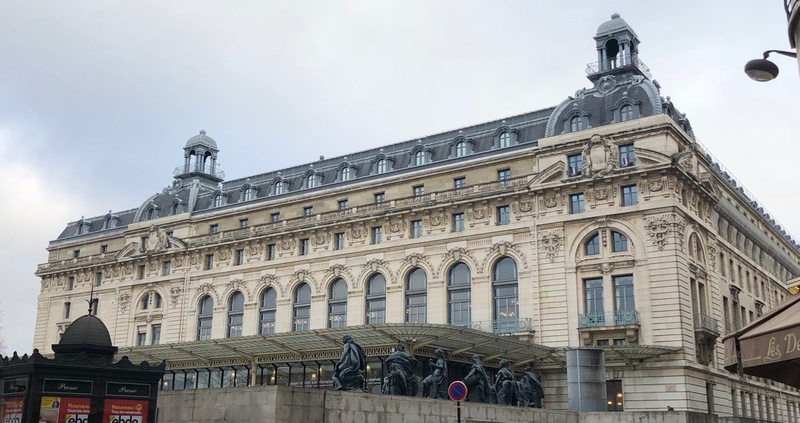 After the Catacombs and a quick lunch, I trekked up to Musée d'Orsay. 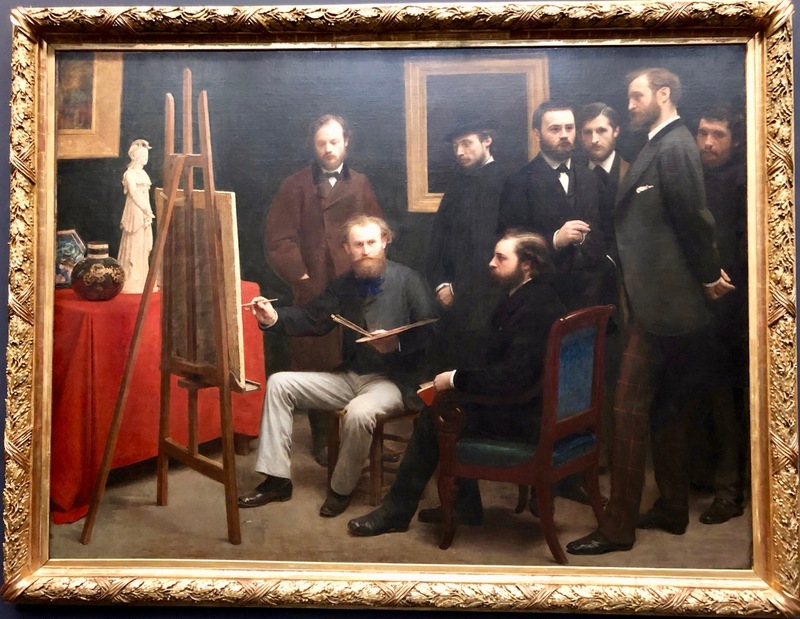 I've been to the Louvre twice and it is amazing, but I always ended up skipping Orsay. Not this time! 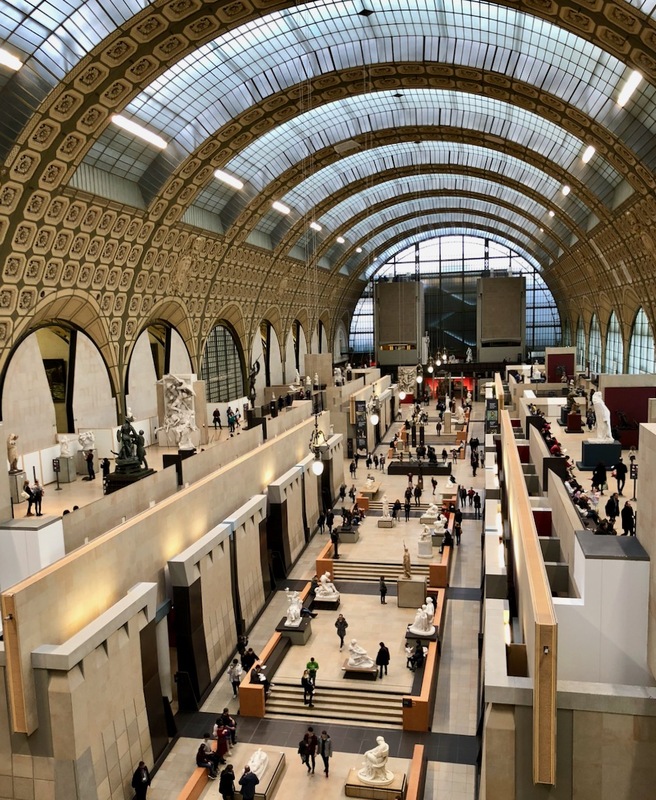 Musée d'Orsay is peaceful, inspiring, and more easily doable in a single day unlike the Louvre. 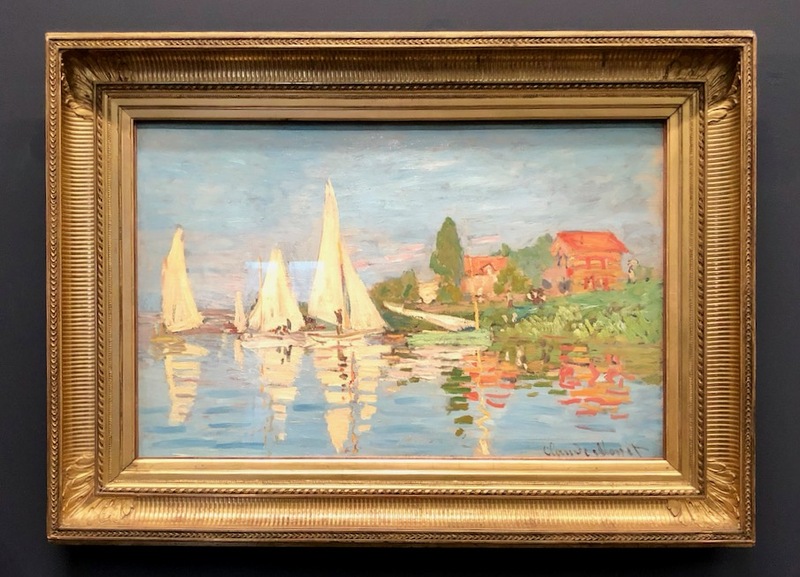 One surprising aspect of this museum is that the building is as much art as the exhibits inside. 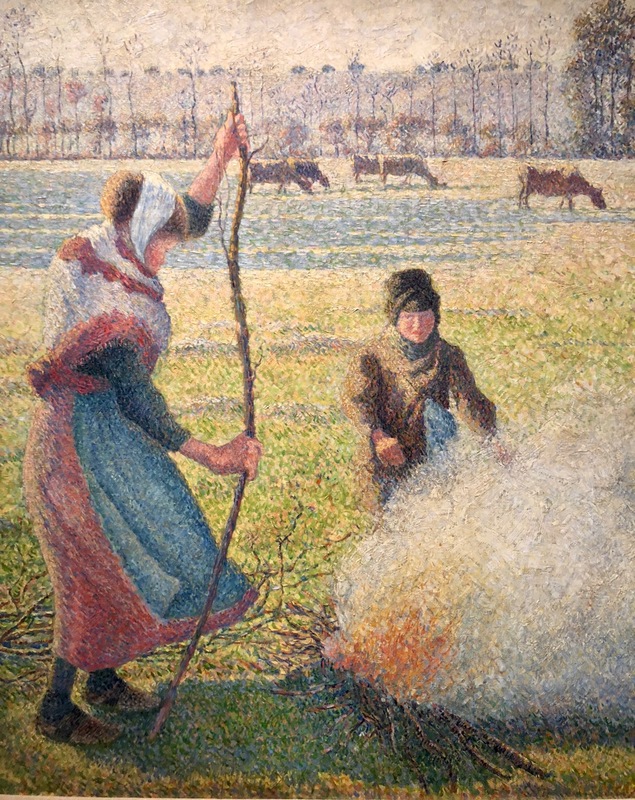 In the museum you can find copious works by Monet, Renoir, and a great exhibit of Edgar Degas. In this panting, it almost feels like the man is painting you, but he's slightly looking to your right. Because it's a flat painting, even if you move to the right he's never actually looking directly at you. 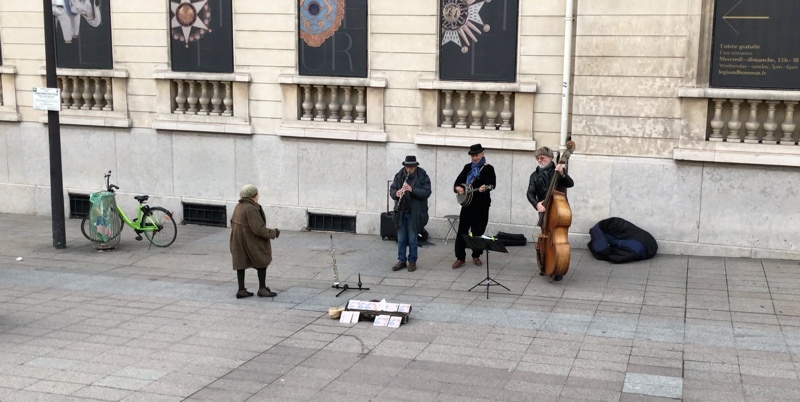 Upon leaving the museum there were some musisians playing music in the square. An elderly lady walked up and started dancing to the music, with not a care in the world. It's hard to describe how much I enjoyed this moment. This type of atmosphere, music, people appreciating it on the steps, this lady dancing, surrounded by an old city full of art & culture. It warms the heart. I finished up the night by walking along the Seine, which was much higher than I have ever seen it before. 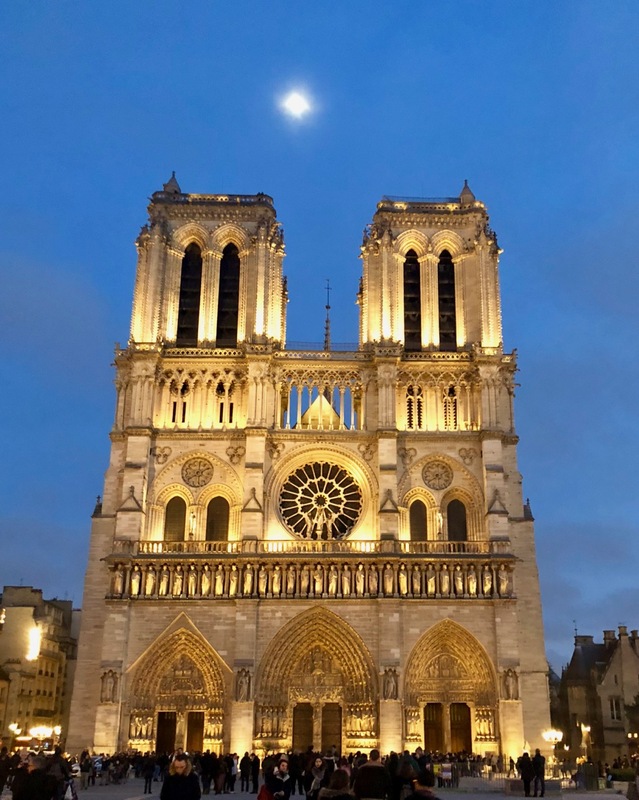 Notre Dame looked especially pretty in this Twilight hour, where the lights were on display, the moon was visible through the clouds, but the sky was still quite blue. 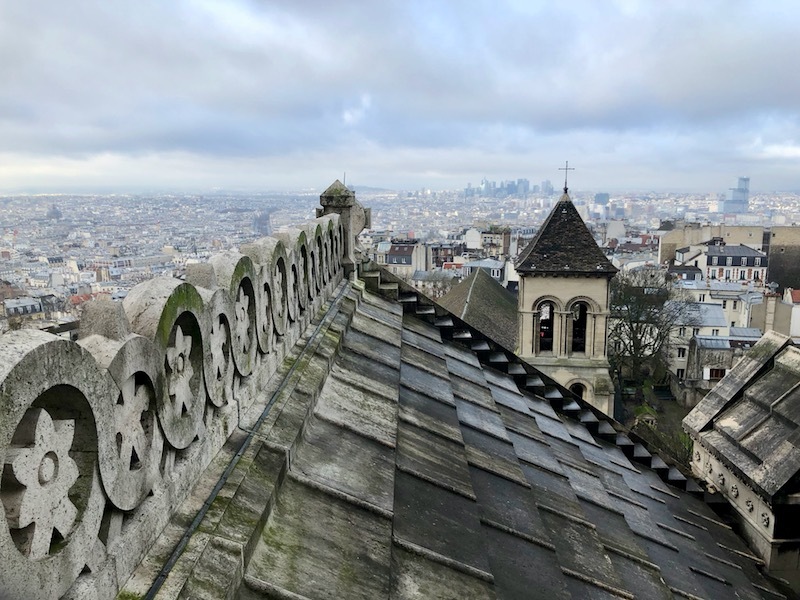 On Sunday I woke up early and headed for a long, uphill walk to one of my favorite Paris destinations: Sacre Coeur. 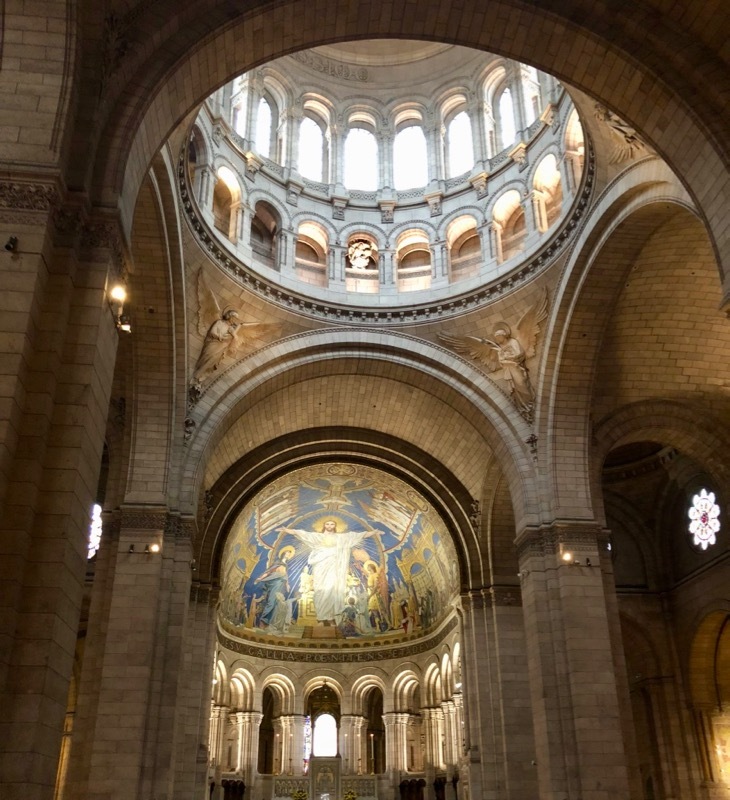 This beautiful basilica sits atop a large hill in Montmarte. 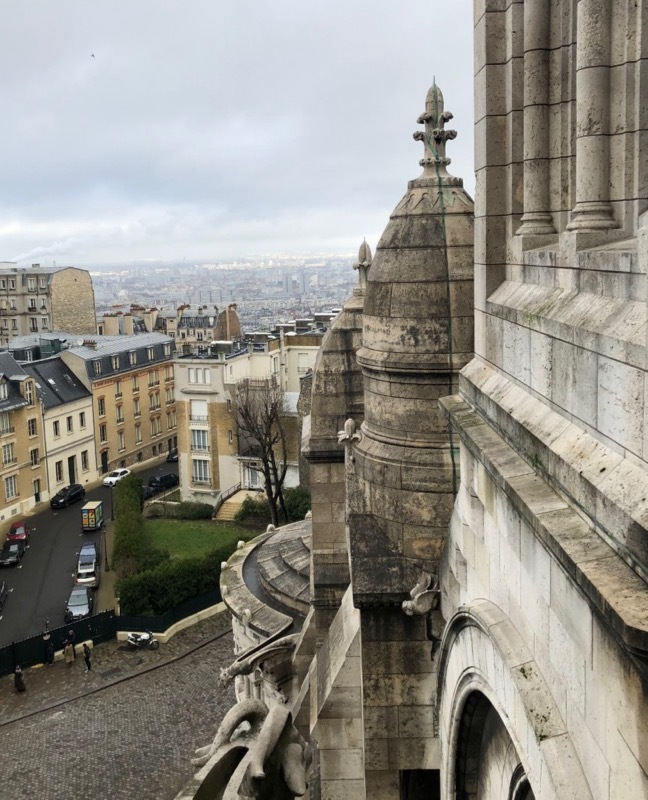 In addition to being gorgeous inside and out, the view from the top is quite breathtaking. 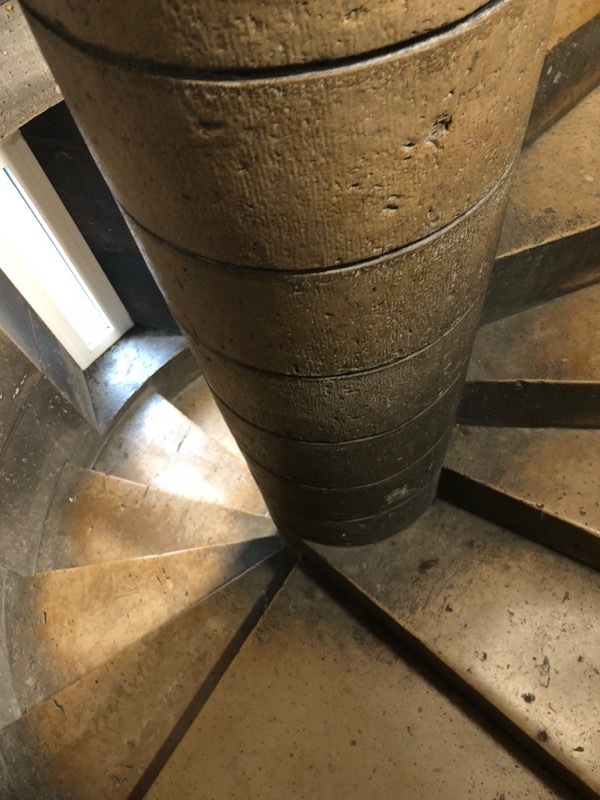 To get to the top, you climb a cramped spiral staircase 300 steps. It is certainly not for the faint of heart (or the claustrophobic)! I was shaky and dripping with sweat by the time I reached the top, but the view was certainly worth it. 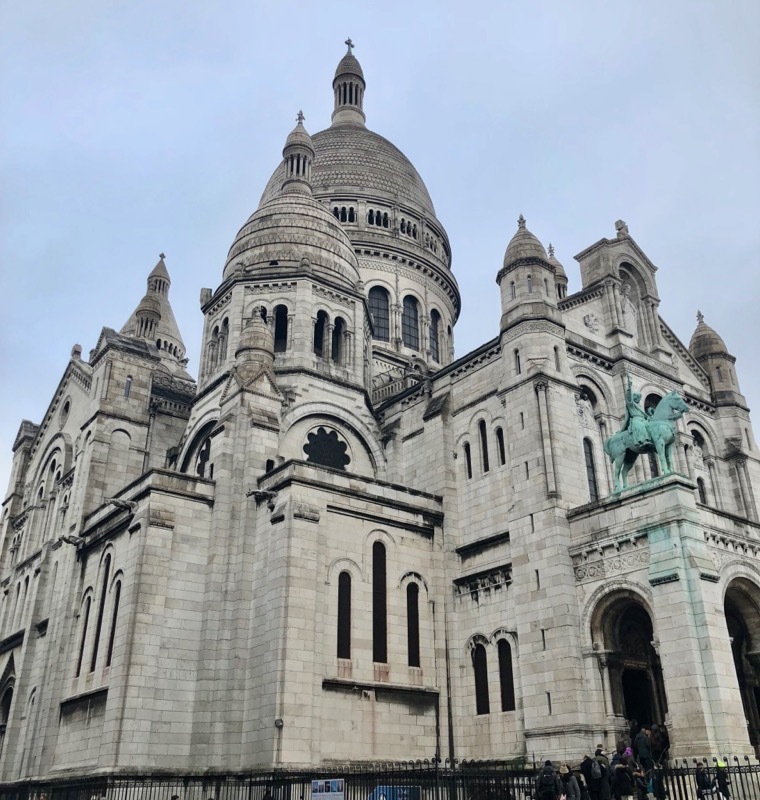 Upon leaving Sacre Coeur I stumbled on another street musician, this time a harp player, and I sat for a few minutes to enjoy the moment. 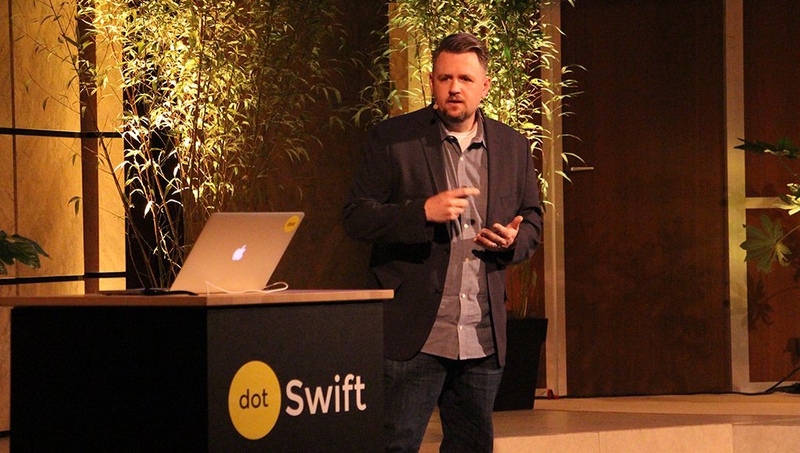 On the conference day I had a great conversation over breakfast with Paul Hudson, from hackingwithswift.com. After that it was back to the hotel room to practice my presentation. This conference is quite different than ones I've spoken at in the past. It is run by the same folks who do TEDx Paris. The timeslot is only 18 minutes long, there's no wifi, and it's in a gorgeous theater. The 18-minute time slot was difficult! This took quite a bit of practice to get down just right. I went on stage around 3pm and talked about MVC and how we can avoid creating overly complex view controllers. I was pretty happy with how the talk turned out. The organizers did an incredible job with the conference. 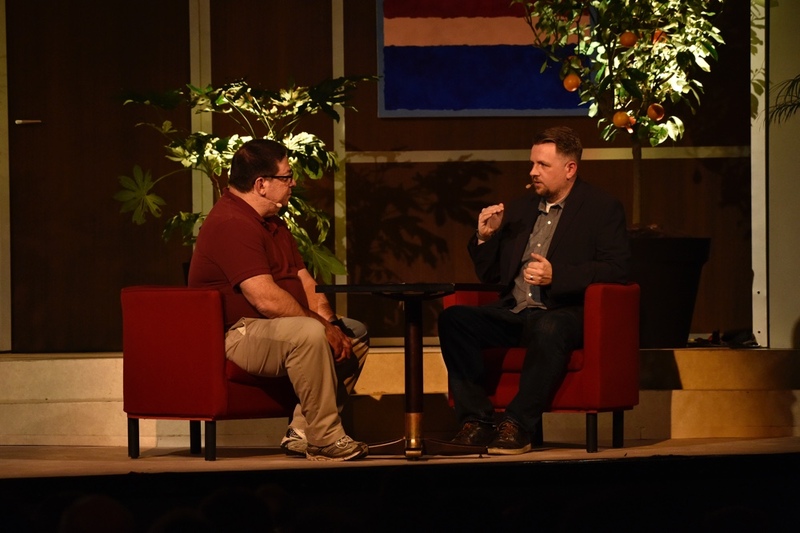 The audio/video production of the show came off without a hitch and it was clear this was run by professionals. The venue? 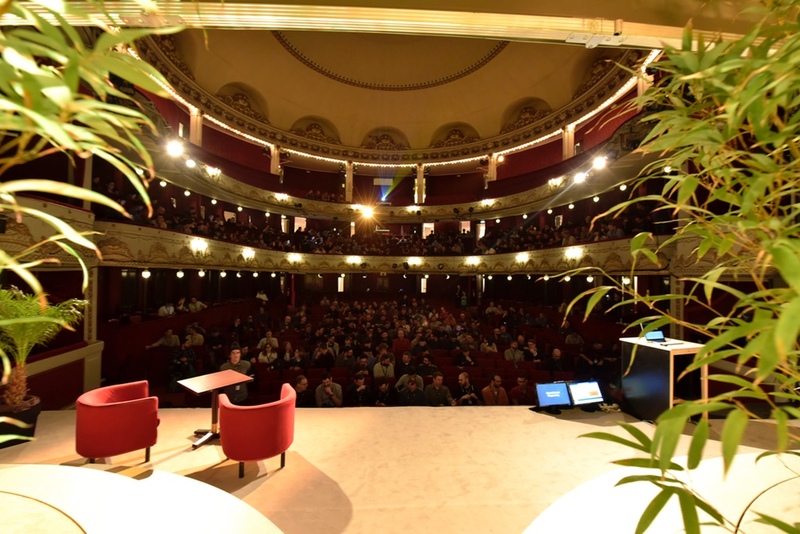 Completely stunning, and having no wifi at the conference meant we had a really attentive audience, which is really helpful for a speaker. Shout out to Daniel Steinberg who did an excellent job as MC of the conference. I think the sit-down Q&A with Daniel was a nice touch to the presentations. 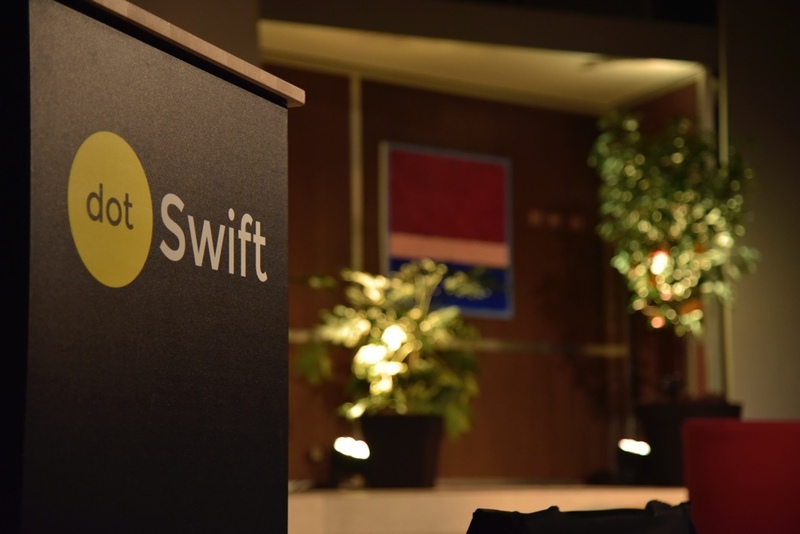 I am incredibly happy and honored to have been a part of dotSwift Paris, and I can't wait to do it again.